The Telfer Health Transformation Exchange (THTEX) is a meeting point for dialogue and learning between healthcare practitioners and health systems researchers. The purpose of THTEX is to facilitate business systems education, research, innovation and collaboration among its members. The members of the Exchange work towards the transformation of healthcare in order to improve patient and system outcomes while optimizing healthcare delivery. By combining the talent and dedication of clinicians, management faculty, the business community and industry, we are in a much stronger position to create new perspectives that advance our shared goal of enabling the transformation of healthcare through innovation and collaboration. The Exchange is focused on the intersection of best practice in operations and organizational management, technology and health delivery that is customer centric. It leverages the long tradition of health management education of the Telfer School of Management with the clinical innovators i n regional health care and related institutions. 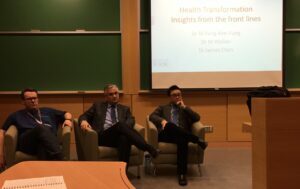 The Exchange is led by two Telfer Professors: Dr. Michael Fung-Kee-Fung, Professor of Obgyn and Surgery who is cross appointed to Telfer School of Management at the University of Ottawa; and Wojtek Michalowski, Professor in Health Informatics and Decision Support at the Telfer School of Management at the University of Ottawa.